Magic Tree House is great at teaching historical facts and events to very young children. They are also very simple to read and characters are always fascinating.Though to the adult reader the repetition in text formats and language may be boring, not to so to the younger crowd... Under 10 children love repetition exactly like their younger children do. This particular books is no exception. 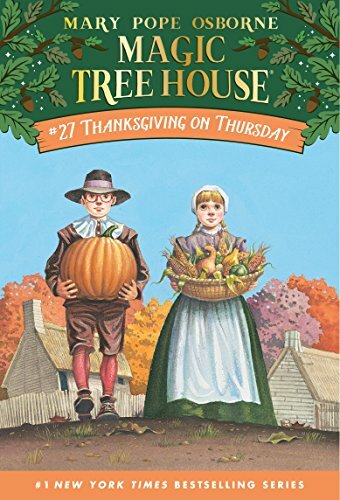 The two siblings go to Plymouth on the day of the first thanksgiving and get busy helping Priscilla, a young Pilgrim, to get ready for the huge feast. Of course, nothing goes exactly like they want them to go, but that helps them find out what is really important. I would recommend this book to children in second and third grade. I think that older children might be challenged with something more difficult. This book is great for Thanksgiving! I recommend this series. My second grade students are reading this in Language Arts and the nonfiction book Pilgrims in Social Studies. Teachers Pay Teachers have wonderful booklets to use with both books. This time we learned about the First Thanksgiving, Squanto, and Priscilla. But most importantly,we learned what community means and how Thankful we should be for all the modern day amenities we have and for our friends and family. Once again, Jack and Annie have taught us important lessons, all while sharing another great adventure with us! Now we're off to learn about Hawaii! 5つ星のうち5.0Magic Tree House books are always a hit. I splurged and ordered a copy for all 7 of my students. We read aloud as a class, and thoroughly enjoyed it. It was a good way for them to learn about Pilgrims, Plymouth Colony, Squanto, etc. It was exciting to me when a student who is a struggling reader was the first to figure out that Jack and Annie had found the magic.